A party may be able to get out of a contract if there was an explicit or implied term that a party could choose to do so. As well, the law gives consumers the right to cancel certain contracts during a "cooling-off period". Client entered into a contract for goods or services and now wants out of the contract, even though there is nothing wrong with what the client bought. Client heard they had 10 days to take goods back to a store, but the store will not accept the goods. If there is no fault in a contract between a seller and a buyer, consumers generally do not have the right to change their mind and get out of the contract. There either must be a reason to get out of the contract, such as the goods being unsatisfactory, or one of the exceptions explained below must apply. If there is no reason, the only way to get out of the contract is if the seller agrees. If this is the case, the consumer and the seller are actually making a new agreement — to let the consumer out of the old agreement. The consumer may be able to get out of a contract if the contract specified the consumer could choose to do so. For example, some department stores advertise that they allow consumers to return any product purchased at the store. In law, the promise in the advertisement would probably be considered a term of every sale contract the store makes (see the Contracts Overview). Or, a seller may promise a particular consumer they could return a product or the contract could be cancelled. Promises stated clearly in a contract are called “explicit terms”. The parties specifically discuss and agree to such explicit terms. Other promises that allow a contract to be cancelled might be “implied” terms. For example, if a store displays a sign reading “No Refunds – Only Exchanges”, it could be argued this gives the buyer an additional contractual right of exchange, regardless of the quality of the product, since the consumer already has the legal right to return goods that are fundamentally defective. There may be either explicit or implicit limits, or both, on the contractual right of exchange. There may also be time limits. For example, some stores advertise that the consumer has a limited number of days to bring any goods back for a refund. If there is no time limit specified, the law would probably say the consumer has a reasonable time to ask for the refund. The law does not have a set definition for “reasonable time”. It varies depending on, for example, what was bought, where it was bought, and what the implied terms of the contract were. There may also be limits arising from the consumer’s use of the product. For example, a store may advertise that it accepts returns as long as the product is, essentially, unused. If there is no explicit term regarding use, the law would probably say that the product has to be resalable as new or near-new before the consumer could ask for a refund. The Business Practices and Consumer Protection Act gives consumers some rights to cancel certain contracts, beyond the general rights in common law. Refer to sections 17 to 56 of the Act and the Consumer Contracts Regulation for specifics. Here are some general guidelines. Many consumers believe they can only cancel door-to-door sales contracts. However, the terms of the Business Practices and Consumer Protection Act actually apply to a wider range of transactions. The Act’s cancellation provisions apply to “direct sales contracts” — contracts for goods and services entered into in person at a place other than the supplier’s permanent place of business. This covers door-to-door sales and other situations. If a direct seller makes a sale somewhere other than a permanent place of business, section 21(1) says a consumer has 10 days after the date that the consumer receives the contract to cancel the contract (longer in some instances). This means that if a consumer receives a copy of a direct sales contract on February 1, for example, the consumer has up to and including February 11 to cancel. the goods or services were not supplied within 30 days of the supply date. The Business Practices and Consumer Protection Act, in section 17, defines distance sales contracts as contracts for the supply of goods and services that are not entered into in person, and, in the case of goods, where the consumer does not have an opportunity to inspect the goods at the time the contract is entered into (for example, online purchases or catalogue sales). A consumer has the right to cancel a distance sales contract no later than seven days after receiving a copy of it if the contract does not comply with the requirements for contracts in electronic form or otherwise comply with the content requirements of the Business Practices and Consumer Protection Act. A consumer has up to 30 days to cancel a distance sales contract if the supplier does not supply the consumer with a copy of the contract within 15 days of the contract being made. If a supplier fails to deliver the goods or services within 30 days of the supply date in the contract, the consumer may cancel the contract. If no supply date was specified in the contract and the supplier does not deliver the goods or services within 30 days, the consumer has the right to cancel 30 days from the date the contract was entered into. 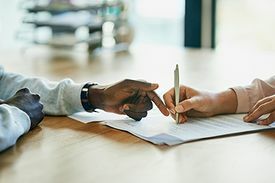 Future performance contracts are defined in section 17 of the Business Practices and Consumer Protection Act as contracts for the supply of goods or services for which the supply or payment in full is not made at the time the contract is executed. Continuing service contracts are future performance contracts that provide for the performance of services on a continuing basis. Examples of continuing service contracts are gym memberships and dance lesson contracts. A consumer has the right to cancel a future performance contract no later than one year after the date the consumer receives a copy of the contract if the contract does not contain the information required by the Business Practices and Consumer Protection Act, such as the supply date, the amount of each periodic payment, etc. A consumer may cancel a continuing service contract no later than 10 days after receiving a copy of the contract, or at any time if there has been a material change in the circumstances of the consumer or the supplier. Examples of material changes in the circumstances of the consumer provided in section 25(3) of the Act are the death, disability or relocation of the consumer. Examples of material changes in the circumstances of the supplier provided in section 25(4) are failure to complete the services within the time specified in the contract, unavailability of the services due to discontinuance or substantial change in operation of the supplier, and relocation of the supplier by more than 30 kilometres. Under section 54 of the Business Practices and Consumer Protection Act, a consumer (or supplier) may give a notice of cancellation by any means that permits a person to prove that they cancelled the contract on a specific date, including delivering the notice in person, or by registered mail, email or fax to the appropriate address or number in the contract. If the notice of cancellation is given other than by personal delivery, it is deemed to have been given at the time it was sent. whether any oral representations were made by the seller aside from the written contract. Before focusing specifically on the common law or statutory rights of cancellation, consider if there are any other applicable remedies that would support negotiation for cancellation. For example, if there was unfairness in the making of the contract, there may be additional rights under the common law or the statute law, such as in the Business Practices and Consumer Protection Act. If the consumer’s right to cancel falls under the common law, either you or the consumer should approach the seller as soon as possible. Discuss with the consumer in advance what kind of cancellation arrangement they wish to make (for example, full refund of payment, exchange for another product, or a credit note for future purchases). If the consumer’s right to cancel falls under one of the statutory provisions of the Business Practices and Consumer Protection Act, then proper written notice should be given within the time limits. Since this right of cancellation is given by statute beyond rights in common law, a court probably cannot extend the time for giving notice of cancellation. cancelling any related credit agreement. This page was last edited on 11 October 2018, at 05:34.